The holidays are a wonderful time, but they can also be stressful. Burr Roofing, Siding, & Windows wants to help you relax this holiday season with 25 Home Improvement Tips! Make it magical with light– brighten your home with outdoor lighting – as easy as lit garland wrapped around your mailbox – but remember keep it classy! Keep the mistletoe away from the pets – did you know that both mistletoe AND holly have high toxicity levels that could lead to major health issues if ingested by your pets? Its best to hang these holiday accents where no animal (or small child for that matter) can reach. Clean your gutters – as the weather gets colder more leaves fall each day. It is important to clean out those gutters once all the foliage in your yard is bare – one cleaning and done! Paint your front door – Looking to spruce up your home before the relatives make the trip into town? Painting your front door is an easy, quick, and inexpensive way to brighten up your curb appeal. Fall leaf clean-up – clean up the yard before big winter snowstorms start to hit. Leaving your yard covered in leaves can cause damage to your grass and ground foliage once snow builds up on top. Add holiday planters to your front stoop – topiary trees are an easy way to make your home look festive and welcoming. 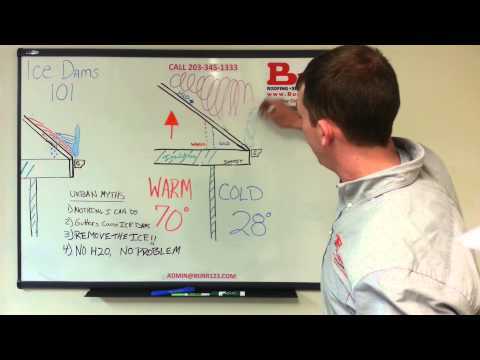 Keep an eye out for ice dams – they can cause major damage to your roof and gutters, pushing water into your home. Check your windows and doors for drafts – wouldn’t want the in-laws to get chilly! If you are experiencing a draft it may be due to a flashing problem. Use wallpaper as fancy wrapping paper – home improvement and gift giving wrapped (literally) into one! Don’t be afraid of artificial trees – nowadays fake trees are designed beautifully, taking the maintenance and fuss out of decorating for the holiday. More importantly, it’s good for Mother Earth! Use zip ties for hanging decorations to avoid nail marks – zip ties can easily be hidden as fasteners; utilize them to wrap garland around stair banisters, etc. Take precaution against carbon monoxide buildup - You’ve got a house full of guests, so the oven and stove are working overtime, the water heater is struggling to keep up with demand, the fireplace is burning, and the furnace is fighting the cold. It’s the perfect setting for carbon monoxide buildup. If you don’t already have a UL-listed carbon monoxide detector, put it on the top of your list. Hanging your front door wreath – avoid ugly nail holes in your front door with this trick -use a tack on the top of your door connecting fishing line to hang the wreath at the desired height. Now, your door will look as good as new once the holidays are over. Use snipped electrical staples as holiday light hangers – this is a DIY alternative to buying traditional light hangers. Some form of light hangers are crucial if your house is sided with James Hardie fiber cement – metal nails, staples, glue, etc. can badly damage Hardie. Tighten the tree stand with a drill – fast and easy – use a hacksaw to remove the little Ls at the end of the tree stand bolts – connect remaining bolt into drill – power away and TA-DA your tree is up and looking beautiful! With the holidays comes a lot of food – most of us look forward to this the most – but if your dishwasher isn’t ready for the job it might be time to clean out the drain and gaskets. Have a fire extinguisher ready – with so much family in one place, it’s best to be ready for everything! Clean your chimney to reduce the chance of creosote fires from wood burning residue – plus Santa has to get in somehow! Clean door knobs and light switches to avoid the spread of any bad winter bugs – no one wants to be sick during the holidays. Limit the use of extension cords to avoid any electrical overloads from outdoor lighting. Set Christmas lights to a timer – this will make your neighbors happy AND save you money on the electric bill. If you plan to travel during the holidays this is a great way to deter any unwelcome visitors by giving the impression that you are home. Add landscape lighting to guide your visitors up the driveway. This addition will also help snow plows to determine where the edge of your driveway truly is to avoid ripping up your yard or gardens. Freshen up the trim throughout the house with a new coat of paint – it will make everything look clean & crisp. Turn off water to exterior spigots and drain them– this will minimize the chance of frozen or burst pipes. Tune up to snow blower before it’s too late – avoid having to break your back shoveling by making sure your machine is ready to go.